Here at Spaced Out, we’ve featured a few posts on how a moving wall can help maximize space. However, such walls can be quite difficult to move if mechanisms aren’t designed properly. This is where a team at MIT’s Citylab and Yves Behar solve this issue by creating a space saving robotic moving wall. With some further refinement(sans gesture controls), they created Ori, and was on a mission to automate furniture and use robotics to make shape shifting apartment a lot more user friendly and accessible to everyone. The key to Ori’s adaptability is making the moving wall a centralized functional volume. Think of it as a moving wardrobe and storage unit; one that not only stores your clothes, but even hides away your bed (trundle style). This way, you can move freely around the volume, but also have the flexibility to give yourself more space when you want to watch TV and have friends over for drinks or dinner. We did come up with a question: What if one person is watching tv and the other is in bed, can the volume still move? The user friendly part of it comes with automating the wall. With the press of a button, the wall effortlessly moves to your desired distance. So those of you who weren’t fans of all the manual flipping and folding, maybe robotics can change your mind as it makes these task super easy! What’s also great about Ori is its adaptability to many different sized apartments. Essentially it’s a smart rail and furniture piece that can attach to any length of wall. 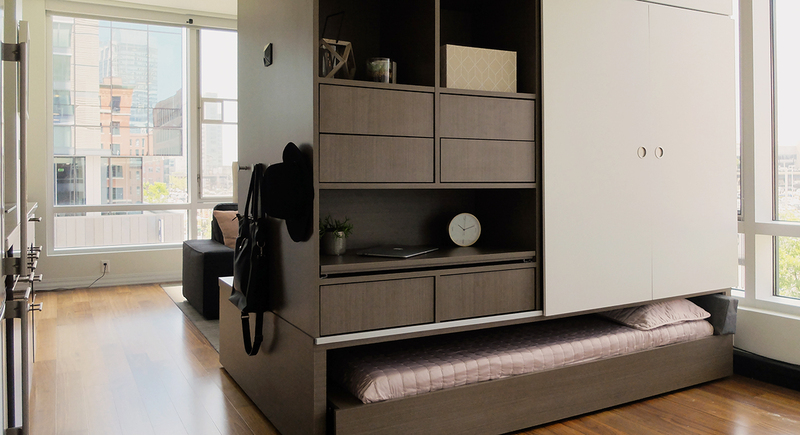 So whether your apartment is 250 or 500 square feet, the Ori wall can intelligently maximize your space. I couldn’t help myself but say, “ this is so cool” when watching the video. It’s nice to see a successful marriage of engineering, computer programming and architecture trying to make people live more comfortably in small spaces, something many HK real estate developers can’t claim as many still advertise stylish but poorly planed apartments. On a positive note maybe with such innovation and truly thoughtful design, developers can get their act together with a space saving robotic moving wall.